A special motherboard requires a special water block, so the tradition with monoblocks for ASUS® ROG® RAMPAGE series motherboards continues. 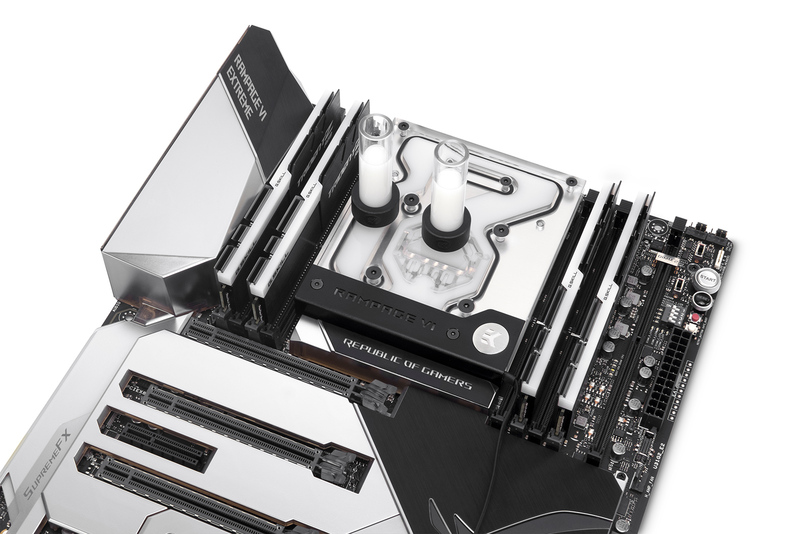 EK Water Blocks, the Slovenia-based premium computer liquid cooling gear manufacturer is releasing new LGA-2066 socket based monoblocks made to fit ASUS® ROG® RAMPAGE VI Extreme and Apex motherboards. 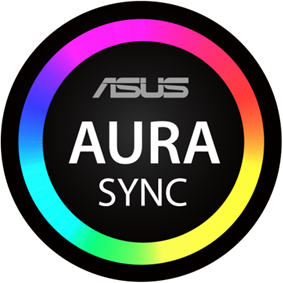 The EK-FB ASUS ROG R6E RGB Monoblocks have integrated 4-pin RGB LED strips which make them compatible with ASUS® Aura Sync, thus offering a full lighting customization experience! Designed and engineered in cooperation with ASUS®, these monoblocks use the award-winning EK-Supremacy EVO cooling engine to ensure best possible CPU cooling. These water blocks directly cool the Intel® LGA-2066 socket type CPU, as well as the power regulation (MOSFET) module. Liquid flows directly over all critical areas, providing the enthusiasts with a great solution for high and stable overclocks. The base of the monoblocks are made of nickel-plated electrolytic copper while the top is available in two options, one is made of POM Acetal with an aesthetical aluminum cover, and the other is made out of acrylic glass material. Like with every EK monoblock EK-FB ASUS ROG R6E RGB, features high flow design and it can be easily used with weaker pumps or silent water pump settings as well. 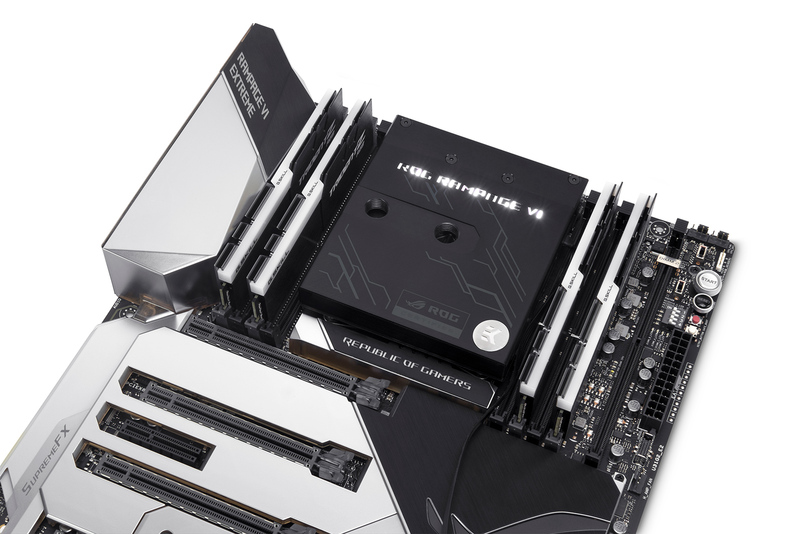 This kind of efficient VRM cooling on an X299 platform additionally brings down the CPU temperatures compared to the traditional CPU water block and stock VRM heatsink cooling solution. These X299 platform based monoblocks also come with a new redesigned cold plate which is becoming a standard feature on all EK monoblocks. The design ensures that the monoblocks have better mechanical contact with the IHS of Intel® Core™ X-series LGA-2066 socket based processors, thus enabling better thermal transfer. The base of the monoblock is made of nickel-plated electrolytic copper while the top is made of quality acrylic glass material or POM Acetal. The nickel plated brass screw-in standoffs are pre-installed and allow for easy installation. 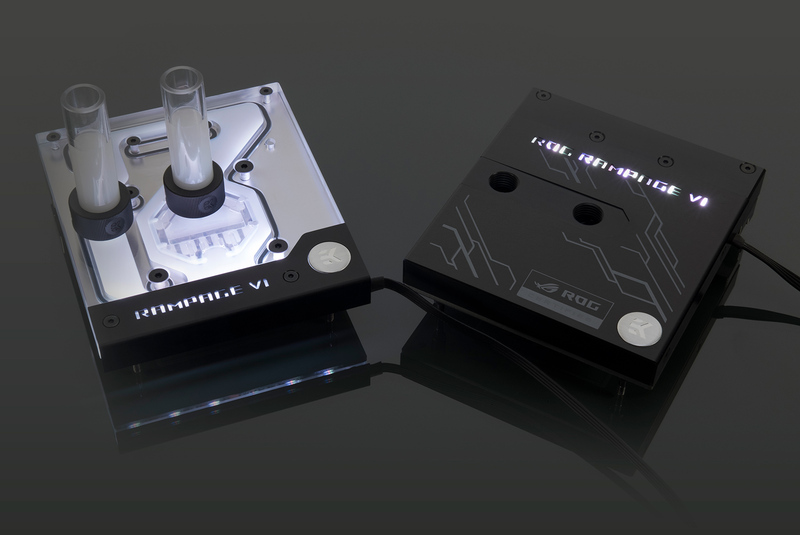 The monoblock is equipped with a 4-pin RGB LED strip that connects to the motherboard’s 4-pin LED header or it can be connected to any other 4-pin LED controller. The LED strip cover can easily be removed for adjusting the cable orientation or replacing the LED strip with a custom solution as well! EK-FB ASUS ROG R6E RGB Monoblocks are made in Slovenia and are available for pre-order through EK Webshop and Partner Reseller Network. All pre-orders will start shipping Monday, 25th of September, 2017! In the table below you can see manufacturer suggested retail price (MSRP) with VAT included.